Sometimes I see you with your head in the clouds and your heart on the floor. You’re a beautiful confusion, a jungle city whose true nature cannot be paved. Though I’ve known you all my life, as I fumble my way home I frequently become hopelessly, irretrievably lost. In my photographs I try to find you. Please — for once — hold still. I am docent of the Singapore Arts Museum. 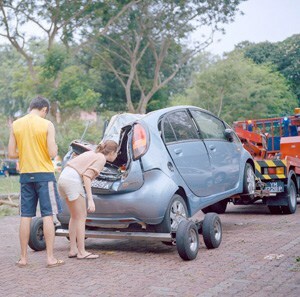 I am very impressed with your Untitled work from the “Singapore” series. I have been asked by SAM to give a short talk on the 5 photographs currently displayed in the Learning Gallery in SAM. Could I have a short chat with you to find out more about your work before my little talk next Monday. I can be reached at 97326603. I read a bit of your profile on tension in big cities and the “befores” and “afters”. I am docent of the Singapore Arts Museum. I am very impressed with your Untitled work from the “Singapore” series. I have asked my SAM to give a short talk on the 5 photographs currently displayed in the Learning Gallery in SAM.